Moraira holidays take you to an area of great scenic beauty on the Costa Blanca where sympathetic tourist developments blend with the original fishing village. 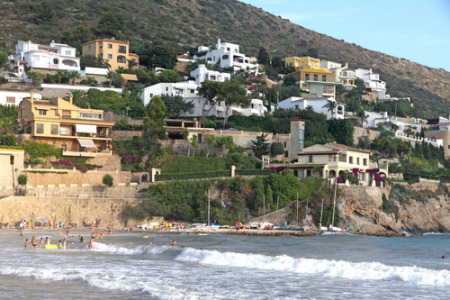 Holidays to Moraira can be taken at any time of year as the summers are long and hot and the winters are very mild. The busiest time is from April until October with temperatures rising to the low thirties at the height of the season. Holidays in Moraira appeal to families, golfers and couples of all ages. The six miles of shoreline are one of the resort's greatest assets. A good range of water sports are available and scuba diving and snorkelling are popular in the rocky waters of the many coves. We have a number of cheap Moraira holidays that are considered great value as our commitment to quality and service remains undiminished. With good accommodation and the many restaurants delighting every palate, our low cost Moraira holidays are sure to please. Shoppers will find all they need in the village shops and in the markets of neighbouring resorts. There are ample opportunities for buying the traditional gifts and souvenirs. If you are seeking a place in the sun where the evenings are as relaxed as the days, our Moraira holiday offers may be just the ticket. For further details and to discover our best Moraira holiday deals, please use the search facility.